Last year, I had the oppunturity to meet Sara Sally LaGrande, a glass bead artist from Kansas ( see her boat-like brooch in the left photo). I really like how she combines wire weaving/working with her funky glass beads. She has a trick where she makes the glass beads right onto the steel wire and then wrap the wire ends into her creations. I thought I would borrow her technique and make lots of glass beads onto thick steel wire, and weld the wires onto my nail birds. After some experiments and using both borosilicate glass and Moretti glass, the boro glass kept cracking on the steel wire due to expansion differences, but the Moretti glass was comparible with the steel. I had to get used to working with Moretti glass since it's not my favorite to work with. 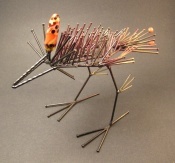 I've made a few birds and welded the steel wires onto their tails with the glass beads, and I really like the color "pop" it gives to the birds. I also made long glass beads with a hole halfway thru the bead so it can be expoyed onto the bird's head. It has been very satisfying to get back to beading and making a lot of the small beads onto the steel wires, and I'm trying to make as many as I can, so I can have enough to make a dozen birds or more. I'm heading back to Snow Farm on the 2nd to teach a week-long workshop. I also hope to do some serious welding inbetween teaching and maybe a few glass beads. I'm getting serious about my glass beads now.